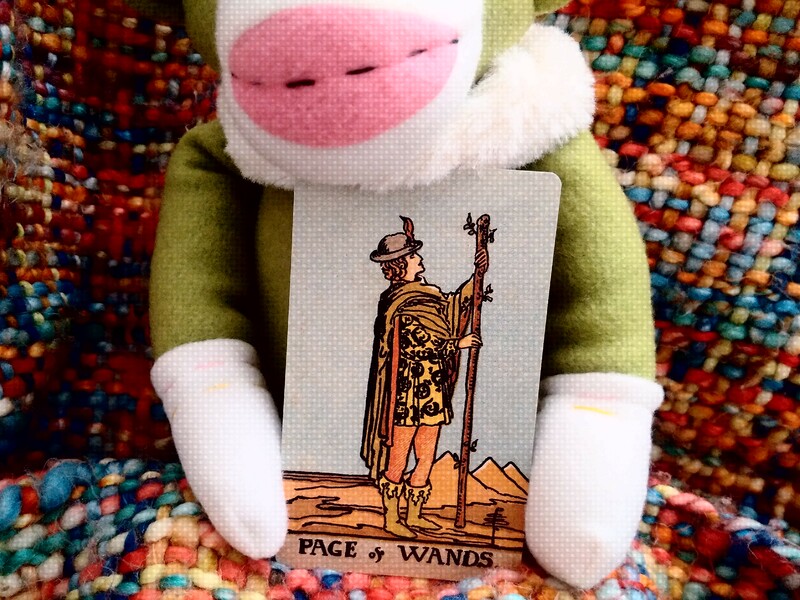 As I return to regular routine with great melancholy, today’s tarot card is the Page of Wands. This dude is rocking the sacral chakra colors like his mother, and you know what? Who says he’s a dude? Court cards like this are traditionally associated with certain genders and even skin tones and hair color, but I prefer to interpret their particular energies, applicable to anyone who embodies the same. In this Page’s case, tones are earthy yet vibrant, a salamander-spotted tunic in vivid yellow depicting the fire within, as she’s ready to embark across a vast orange landscape of creativity and passion. She’s cloaked in courage and ambition and looks fondly at her wooden staff, seeing the fertile green potential sprouting from it, a wand for her to wield and create with as she forges ahead with naivety yet determination and drive. She’s only scratched the surface of what she can achieve, or is about to, and while she might stumble here and there on the peaks and valleys of her journey as she learns and grows, she learns and grows all the same, the wand steadying her steps ever more. She’s focused and free, her lust for life and to reach her goals already a feather in her cap. As I’m renewing my daily tarot practice and looking to work with other new decks today, I like to think both of these cards are signaling this rekindled creative and metaphysical focus. 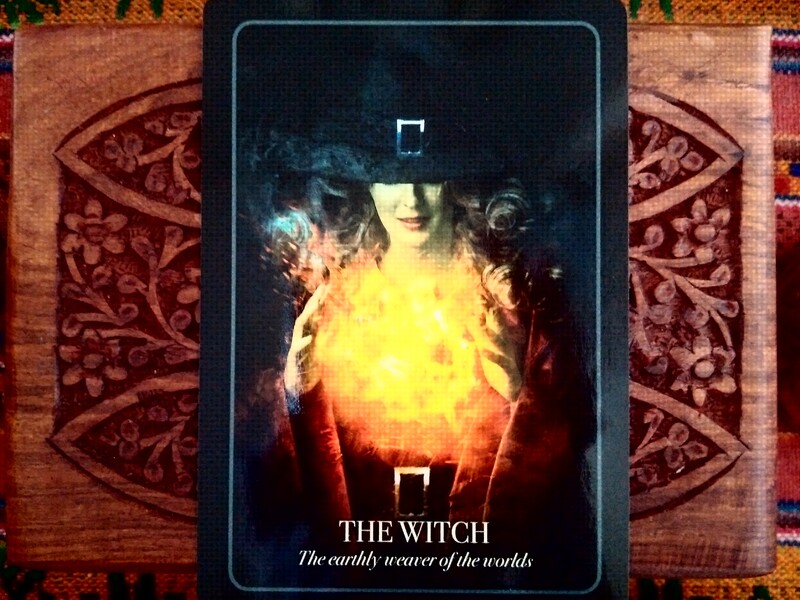 The Witch manifests fire with her own two hands, just as the Page seeks to apply the fire of her mind and spirit to bringing something into being. Working with tarot and oracle cards does give me a sense of uniting the unseen with the seen, the physical cards feeling so amazing in my hands as my mind and soul energy melds with them to create visual messages of what lies within. These messages are a call to action as well, which embraces the energy of both Wand and Witch: intentions made manifest. My chosen crystal pairing: vanadinite, for focus and fire. This entry was posted on Friday, September 14th, 2018 at 10:30	and tagged with fire element, Halloween Oracle, manifesting intentions, metaphysical, Page of Wands, Rider Waite, Tarot, tarot card a day, tarot reading and posted in Mystic Monkey, Tarot Journal. You can follow any responses to this entry through the RSS 2.0 feed.